Just a quick shot of Mr WKD Imports himself Wesley Keating throwing down a pretty brave entry during a practice run at Lydden Hill today. 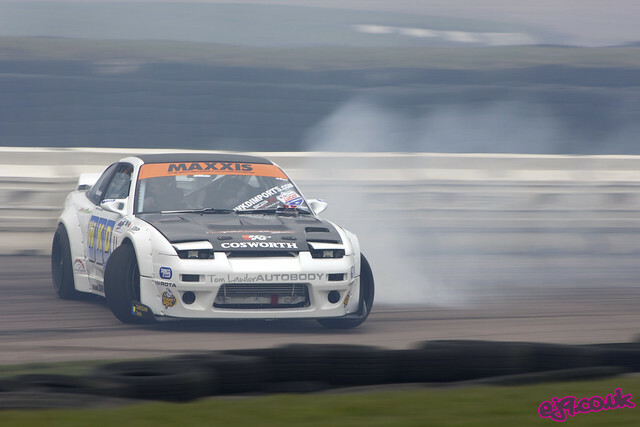 The weather at Round 1 of the British Drift Championship has been varied at best, with the rain starting to fall shortly after the start of the Semi-Pro qualifying runs. Super-Pro qualifying has been delayed until Sunday, where they will have two shots at a qualifying position rather than the usual three due to time constraints. Stay tuned for my write-up(s) from the event during the following week.